who doesn’t love a laugh? The Germans! Actually they’re ok in our book. If you’re reading this because you’ve never been to a comedy night before then strap yourself in and enjoy the ride. As we know Glasgow has some of the finest comedians in the World. Billy Connolly, Frankie Boyle, Jerry Sadowitz, Kevin Bridges…the list goes on. In Glasgow, the training begins at school. Your sense of humour is yourself defence mechanism from bullies and the quicker you are the higher your social status becomes. Fast forward a few years and your now in the pub (it’s Glasgow after all). A good night out is often like a tennis match with the banter going back and forth for a few hours and sharing funny stories of mishaps, strange encounters and funny observations. Being at a comedy show is like having the funniest guys at the pub sitting at your table sharing their best stories. Not only do we run our show, we’re also comedy lovers and the big boss man is a regular on the Scottish comedy circuit. This means our acts are handpicked. We know who the new guys are and which established acts are on form. Not only that, we’re in contact with all the independent clubs all over the UK so when there’s a big act coming to town, or someone see’s an act they think would be perfect for us, a recommendation comes in. Furthermore, our magicians and burlesque acts are often comedy orientated and often get bigger laughs than the comedians. 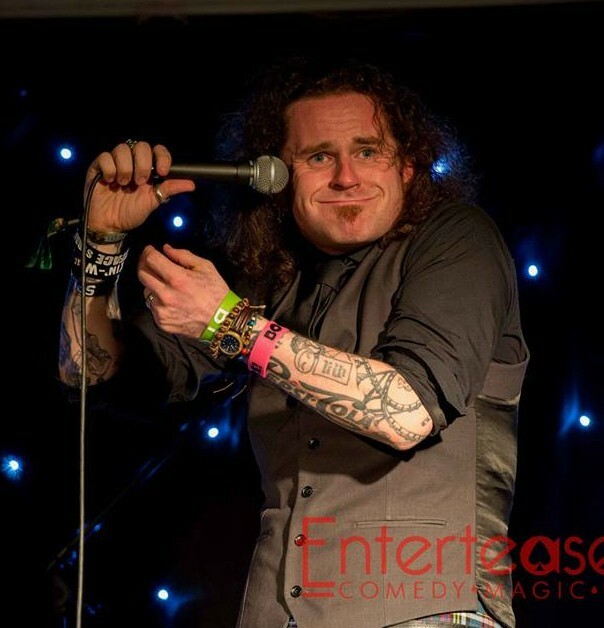 Compere: (also known as a host or MC) The compere comes on stage, chats to the audience, gets to know some people, tells some funny stories and creates a friendly environment. Essentually the compere is there to warm the crowd up. Magician: Our magicians will normally blend comedy with magic by use of props of jokes. Main Support: In the middle section a comedian will come on and provide a 10 – 15 minute set. Out Main support acts are sometimes acts who are headlining elsewhere that evening but like doing our night as it’s just such a good atmosphere. Burlesque: burlesque is about telling a story – often whilst taking off their clothes. One of our favourite acts was a girl dressed as a poodle. During her act her fur would get sheered and the big finish was hilarious (I’m not spoiling it incase we get her back). Headliner: Our show finishes with our Headline comedian. Our headliners are the same as the other big comedy clubs like The Stand, Jongleurs etc. However, we’ve also had acts from Mock the Week, Live at The Apollo and The John Bishop Show. Will I get picked on if I sit in the front row? Probably not. The compere will probably talk to you but the extent of the conversation will probably be asking what your name is and ask what you do for a living. If you work in a hospital and one of the acts has a funny story about a time is hospital then they might tell that story but chances are you’re safe. If that terrifies you, think of the last time you met someone new what questions did you ask them. If you asked their name and occupation then you’re a big scary monster. Is it all about heckling? Noooo! Heckling ruins comedy shows. There’s lots of people who have watched the likes of Roy Chubby Brown. During his set, a heckler would shout something out and the next five minutes would be spent with Roy destroying the heckler to the pleasure of the audience. Lots of people have seen this and think the comedian is sitting waiting for someone to shout out. In reality, most comedians have a set that lasts 20 minutes. This set has been perfectly crafter over years and taking two minutes out of your set to have an argument means you have to adjust your set. it’s like taking your favourite book and riping a few pages out the middle. Taxi Driver: Every taxi driver in the world disagrees with the above because he picked up a comedian once who said they like heckles. I’ve often wondered when you get your taxi licence if you’re handed a magic tree, a crap taste in music and this story. Put on the TV, are you honestly trying to tell me all the stuff on there is good? In comedy there’s a lot of box ticking and very often the next comedian to make it on TV won’t be best comedian on the circuit. They’ll fit a certain look / genre / bracket. That comedian will then employ other comedians to write jokes for them. If you want to see a good comedian, get yourself into a good comedy club.